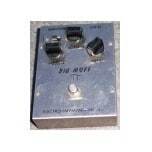 Big Muff. Small Stone. Electric Mistress. Deluxe Memory Man. Holy Grail… Should I go on? So many instantly recognizable and oft-copied effects bear the Electro-Harmonix name, and in turn, those effects appear on countless recordings spanning decades, from Pink Floyd to Mudhoney to the White Stripes. Founder Mike Matthew’s ingenuity and passion for music has made EHX the go-to company for guitarists and bassists for years. And now, with the introduction of the Voice Box Harmony Machine/Vocoder, singers can get in on the action too. 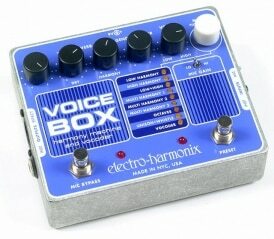 The Voice Box is a virtual choir in a convenient stompbox, and its sonic depth is matched by its ease of use. There are nine operation modes in all, including six harmonizer settings as well as Octave, Unison + Whistle, and Vocoder functions. The Six-knob control set is standard Electro-Harmonix: simple but powerful. I had the most fun with the Gender Bender parameter, a formant adjuster that makes select harmonies sound more male or female. The control will apply this formant shifts to certain harmonies depending on the mode you’re in, making it a snap to add gender variance to the affected vocals. In addition, you can easily program a preset for each mode, so you can instantly recall your settings without having to adjust any knobs. Connecting the Voice Box is a cinch. On one side is a balanced XLR input for your mic and a ¼” instrument input (the Voice Box uses an external instrument to provide the reference pitch for complex harmonies, though the Octave and Whistle modes don’t require one); on the other are matching outputs. There’s a small two-way switch to set the gain on the mic preamp to best suit your microphone of choice, and phantom power is provided for condenser mics. Let’s first look at the Voice Box’s six harmony modes: Low, High, Low + High, and Multi Harmony 1, 2, and 3. The first two are pretty self-explanatory–the Low setting gives you two harmonies below your sung vocal, while the High does the opposite. The intervals of the harmonies will adjust to the chords of your instrument, so if a fourth is required instead of a third, the pedal will output the harmony appropriately. The Low + High modes, with one voice above yours and one below. 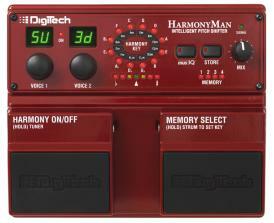 The Multi Harmony modes take things a step further, providing up to four part harmonies in addition to your own voice. Multi Harmony 1 provides lower third, lower fifth, and upper third harmonies; Multi Harmony 2 adds in an upper octave; and Muli Harmony 3 replaces the lower third with a low octave and adds an upper fifth. Not only is the Voice Box incredibly versatile and musical, it sounds fantastic. The harmonies sound remarkably natural, even when you tweak the Gender Bender knob to enhance the male/female tone of select harmonic intervals. The glissando–the “glide” in pitch from one note to the next–is also spot-on, with no artifacts or weirdness in sound when your voice climbs or drops pitch–the harmonies follow right along with your voice. In addition to all its wonderful harmonizing functionality, there are some extra goodies that put the Voice Box over the top. The first is its amazingly articulate 256-band vocoder. Once I got the hang of it, I found it very easy to coax out those signature tones that have graced many popular tunes over the years (personally, I had to learn some licks from Pink Floyd’s Animals). In Vocoder mode, the Voice Mix and Gender Bender knobs let you shape the sound and articulation of the effect even further. As if the Voice Box didn’t do enough already, Electro-Harmonix also saw fit to include a great-sounding reverb with separate controls for both your dry vocals as well as for the harmonies the pedal generates. Additionally, there is a “double mode” of sorts called Unison + Whistle. Using the Voice Mix knob, you can blend the two effects, or use one of the other. In Unison mode, you can change the formant of your vocal without altering the pitch. So, say you want to sing a female part–just enter Unison mode, turn the Gender Bender knob clockwise, and voila–your voice will sound more female! Moving the Voice Mix knob clockwise takes you into Whistle mode, which adds a whistle effect that’s two octaves higher than your voice. I enjoyed using this to add a haunting, eerie effect to my vocals. No longer do guitarists get to have all the fun! The Voice Box from Electro-Harmonix delivers all the exceptional sound you’ve come to expect from their pedals, making it a snap to add rich, natural-sounding harmonies to any performance. Beyond that, it’s also a full-fledged vocoder, and features enhanced controls and operations modes for unmatched versatility, live or in the studio. Heck, I’ve even read about people running horns through it! Vocalists, singer-guitarists, and even instrumentalists who may never have thought about signing will find incredible inspiration in this powerful tool. I’m interrested in getting a voice box can you tell me what city closer to North Bay ont. could I buy one?